HR essentials membership – £99 (+VAT). Full unrestricted access to letters, agreements, checklists, some GDPR documents and forms. H&S essentials membership – £99 (+VAT). Access to checklists, registers, audits, logs, permits, signs, posters and questionnaires. HR premium membership – £249 (+VAT). All of the benefits of essentials membership plus contracts, policies, management guides, training videos and *sector specific packages. H&S premium membership – £249 (+VAT). All of the benefits of essentials membership policies, training videos and sector specific packages. You can upgrade/downgrade or cancel your membership at any time and you will never find any “hidden charges”. *Sector specific packages contain the key documents needed in any particular sector. The wording in each document has been updated to ensure that it is perfectly suited for use within each sector (for example professional offices, schools, builders etc.). Select either the HR Docs or Health and Safety Docs tab. The one you have selected will be highlighted in purple. 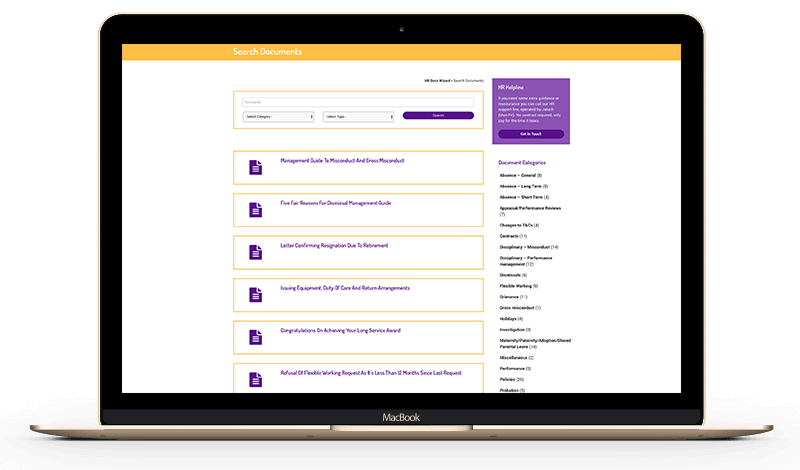 You can find documents by entering key words in the search bar or otherwise scroll down and click on one of the ‘categories’ to see a list of available documents by topic. Our sector specific packages contain 5 or 6 key documents relevant to individual business sectors (i.e. professional office, hairdressers, care homes), you can access these by selecting ‘sector specific’ packages. Available to premium members only. Not all sectors currently available. If there is a document you need but you can’t find it online email us occasionally miracles do happen and we might be able to find, or create you what you need! If you have a HR Docs subscription, we provide two additional, optional services. In those instances when you would just like some reassurance, you can use our document checking service. For a one-off fee we will check any of your edited HR Docs Wizard template documents, you can find more information on this service here. For more complicated matters, or if you’d like to talk an issue through with a real person – we provide a HR Helpline which is operated by Jaluch, Monday-Friday (9am-5.30pm). Simply give us a call on 0207 096 4455 or fill in our contact form here, explaining what the issue is and when you would like us to call you. We offer a pay-as-you-go service, so you will only be charged for the time you need. Additional payment options are available which you will be able to discuss with our consultants, if you choose to use this service. These services are not currently available to H&S members.